Altogether, the mission team provided 60 new joints to people that would otherwise never have the means to have their severe arthritis treated. Operation Walk is a not-for-profit volunteer medical services organization that provides free surgical treatments for patients in developing countries and in the United States who suffer from debilitating bone and joint conditions, such as arthritis, and do not have access to medical care. Founded in 1994, Operation Walk teams have operated on hundreds of patients in Russia, Cuba, Nepal, China, the Philippines, Peru, Nicaragua, Mexico and the United States. Over 6,000 patients have received new knees and hips through the International Operation Walk organization since 1994. Dr. Carothers, P.A. 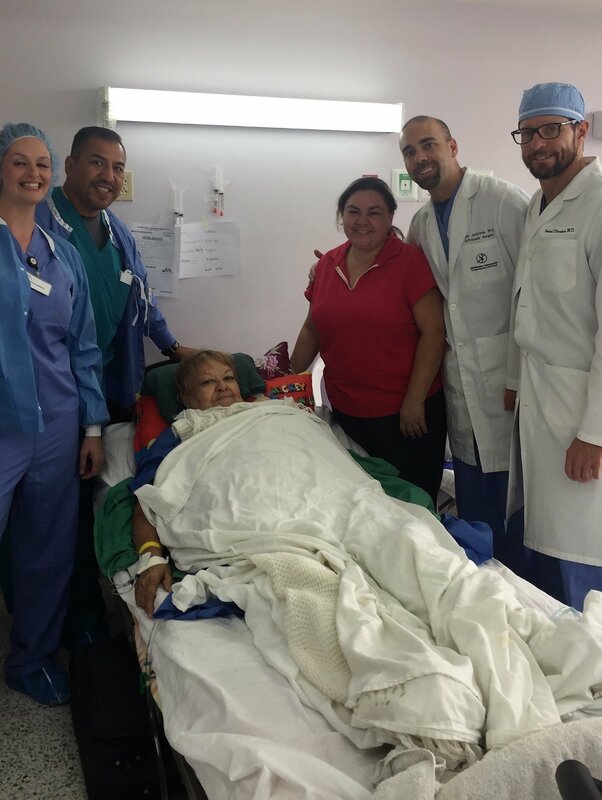 Tyler Jefferson, and nurse gave this patient a new knee on September 30, 2017. The week-long mission trips are designed to restore the gift of walking to as many people as possible, typically more than fifty patients while educating local healthcare workers in advanced surgical and rehabilitation procedures. “I have been working and traveling with the group to Panama and Honduras over the last 6 years,” said Dr. Carothers “and have been really proud to bring a team from Albuquerque that represents our city so well”. NMOA surgeon Joshua Carothers focuses on total knee and hip replacements at the New Mexico Center for Joint Replacement Surgery, one of the Centers of Excellence at New Mexico Orthopaedic Associates. His Medical Degree is from the University Of Cincinnati College Of Medicine in 2002, where he graduated first in his class. He completed a five-year residency in orthopaedic surgery at Duke University Medical Center in 2007 and an adult reconstruction fellowship with Colorado Joint Replacement in Denver in 2008. The independent physician group concentrates on the diagnosis and treatment of musculoskeletal injuries and degenerative conditions. NMOA includes more than 30 physicians who provide both surgical and non-surgical treatment options for patients. The group’s comprehensive care model integrates the diagnosis, treatment, and rehabilitation of orthopaedic, sports medicine and spine care within one practice. NMOA offers patients a choice of two clinic locations in Albuquerque and Rio Rancho. NMOA provides surgery in a physician-owned surgery center, physical and occupational therapy, X-ray and MRI, Quick Care Clinics and workplace injury care. NMOA has been serving patients for over thirty years.